The smartest landscape 5S artwork available. Launch your 5S campaign with this powerful visual. This product cleverly outlines the 5S Principle with the use of a graphical representation of each of the Esses! 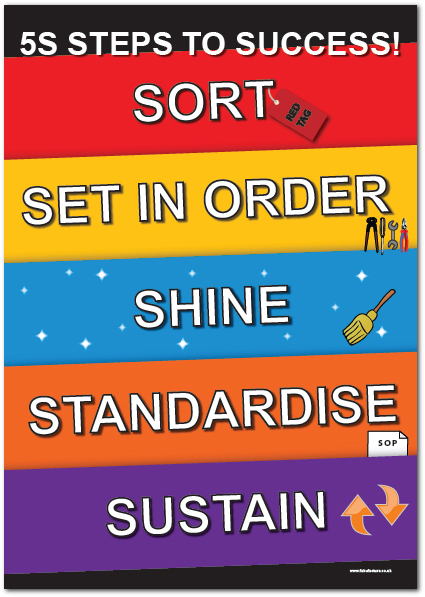 SORT - SET IN ORDER - SWEEP - STANDARDISE - SUSTAIN. Make sure your 5 S campaign gets off you the best start, by ensuring that everyone in the building knows exactly what you company stands for. This sets of FIVE (4' x 1') banners not only communicate clearly the 5 S principles, but they explain / train the actions that need to be taken to achieve 5 S compliance. This package allows individual 'S' banners to be arranged on your chosen wall or fence / railing location, or other structure.